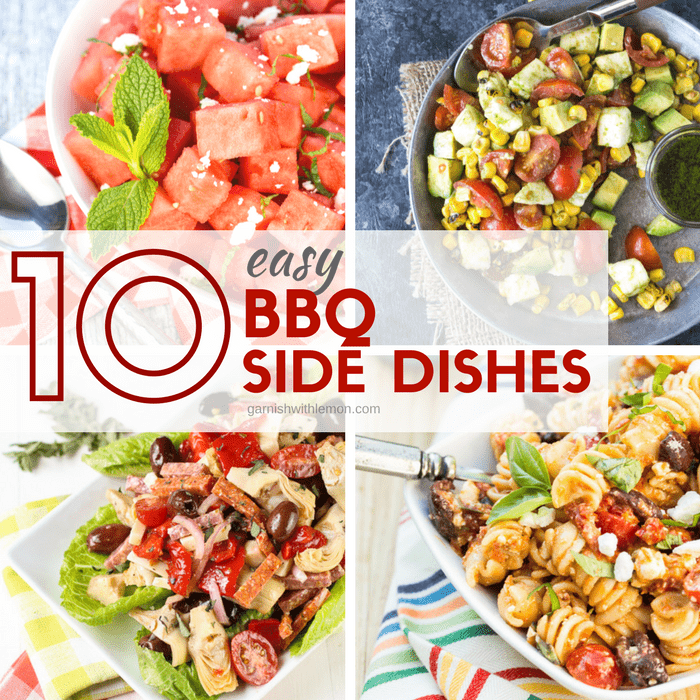 Pin this list of 10 Easy BBQ Side Dishes and never wonder what to bring to another summer grill out again! Here in Minnesota, we don’t take our summers for granted. We fill every waking minute of warm weather with opportunities to be outside, whether it’s an informal lunch on the patio after a morning of yard work or a leisurely backyard dinner watching the sun go down with friends and family. But even our favorite summer food menus need a little inspiration now and then. Add a little variety to your next grill out with this list of 10 Easy BBQ Side Dishes. No summer picnic is complete without a pasta salad. 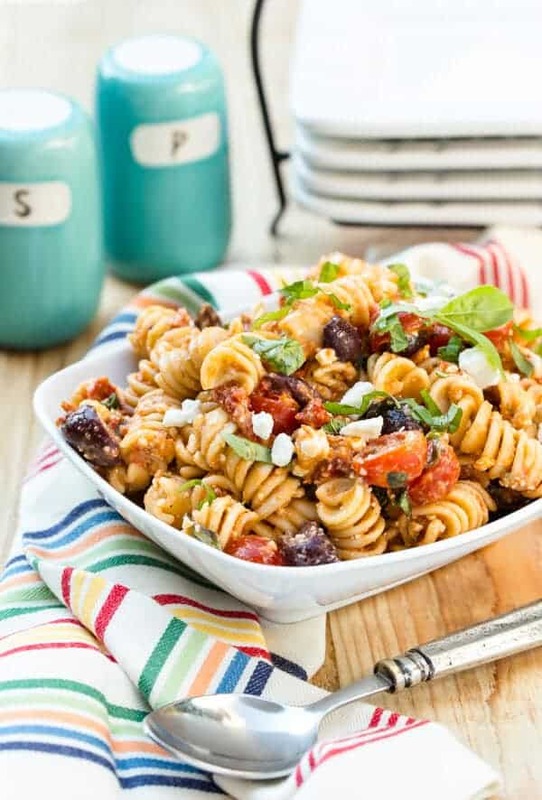 This crowd-pleasing Tomato Feta Pasta Salad is packed with sun-dried tomatoes, feta cheese and kalamata olives in every spoonful. 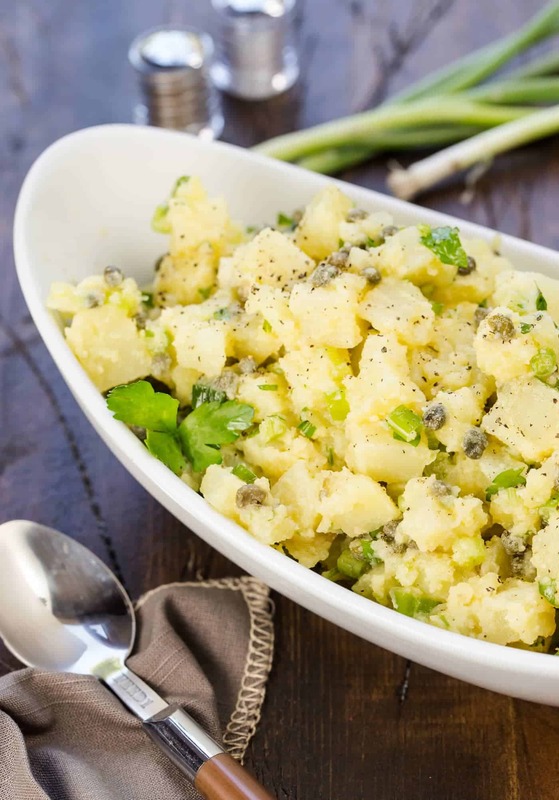 A far cry from your traditional potato salad, this Danish Potato Salad gets its pretty yellow color from Yukon Gold potatoes and its briny bite from capers, mustard and scallions. A fantastic mayo-free BBQ side dish! 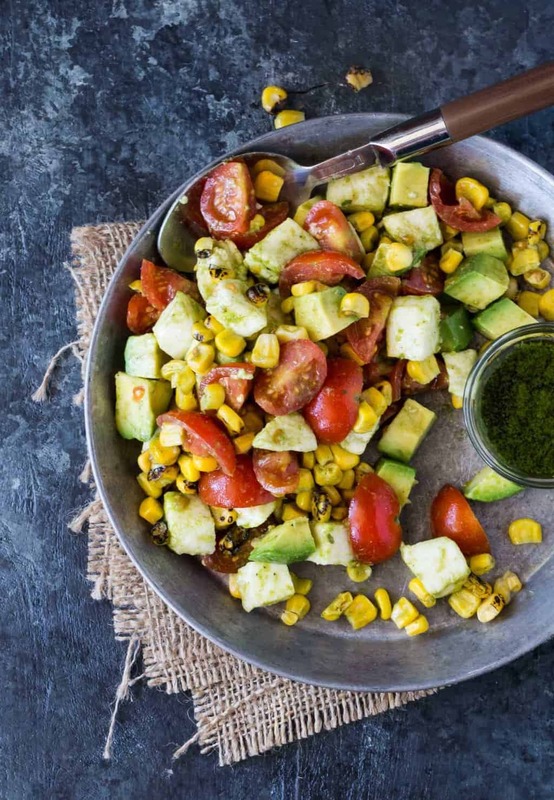 Hands down, this Tomato, Mozzarella and Grilled Corn Salad is one of my favorite summer salads with a unique flavor twist from the cilantro-based dressing – love, Love, LOVE IT! Definitely add this one to your rotation of easy BBQ side dishes. Want to serve something a little more substantial for your meal? 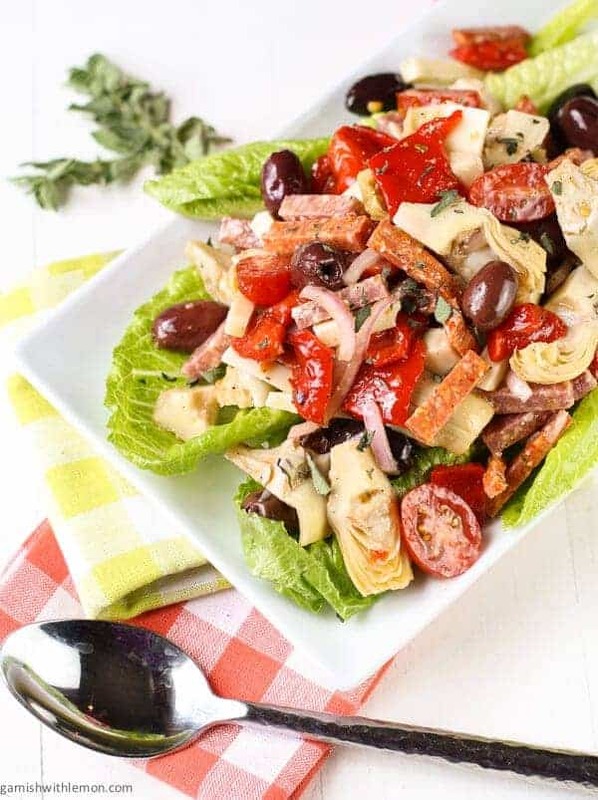 This Antipasto Salad with Red Wine Vinaigrette – packed with meats and veggies – fits the bill beautifully. Yes, you can put a twist on boring old fruit salad! 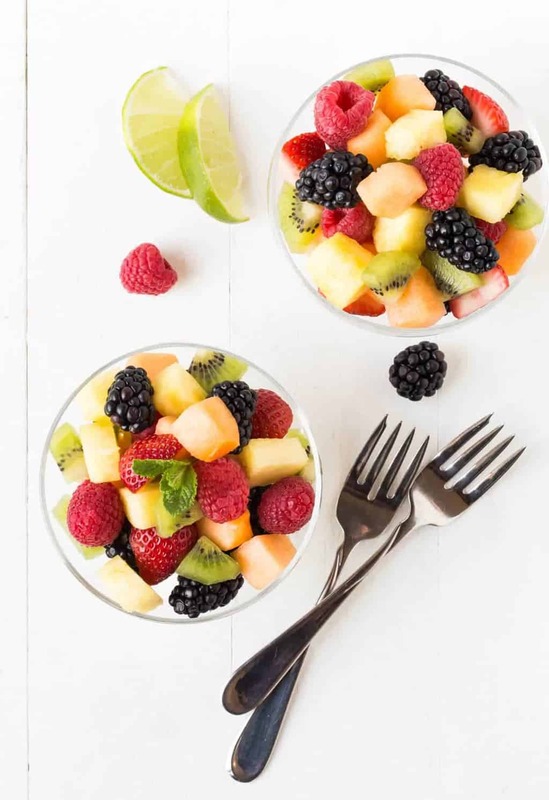 One taste of the lime mint dressing in this Fruit Salad with Lime Mint Syrup recipe, and you’ll be back at the buffet table for more. 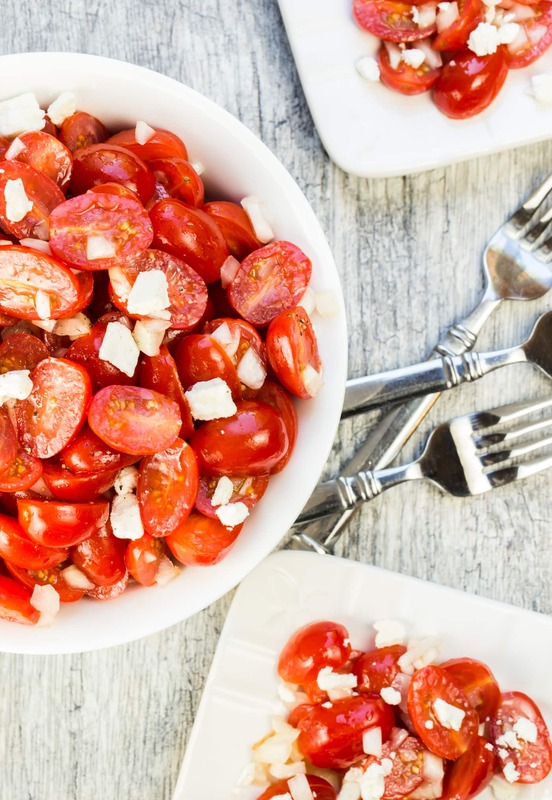 A handful of ingredients really make this Tomato, Feta and Vidalia Onion Salad shine, especially when juicy, ripe grape tomatoes are crowding the markets. Easy BBQ side dishes don’t get much simpler than this! 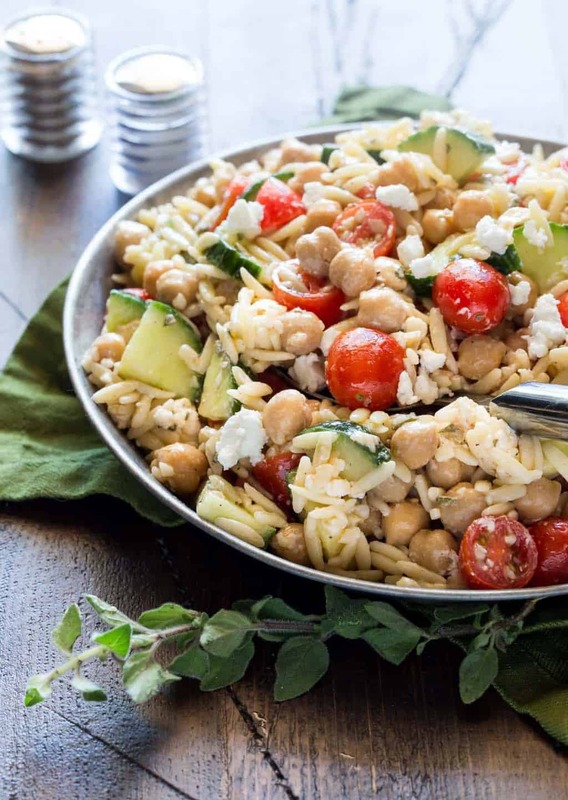 Pack some protein into your summer pasta salad with this Easy Orzo and Chickpea Salad! 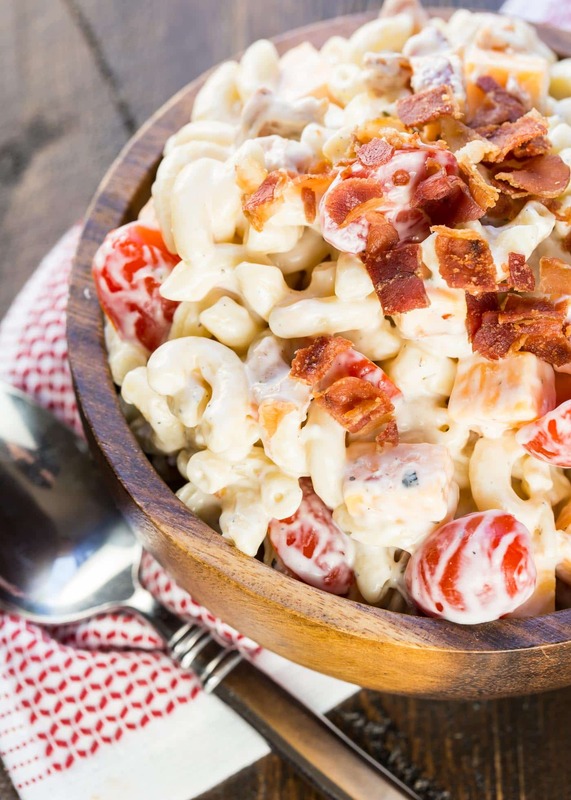 This Bacon Ranch Pasta Salad is another go-to recipe for feeding a large group. Who can say no to a make-ahead salad filled with bacon, tomatoes, cheese and a creamy ranch dressing? Savory and sweet can’t be beat in my book, and the combination of sweet melon and salty feta in this Watermelon Feta Salad makes my mouth water. 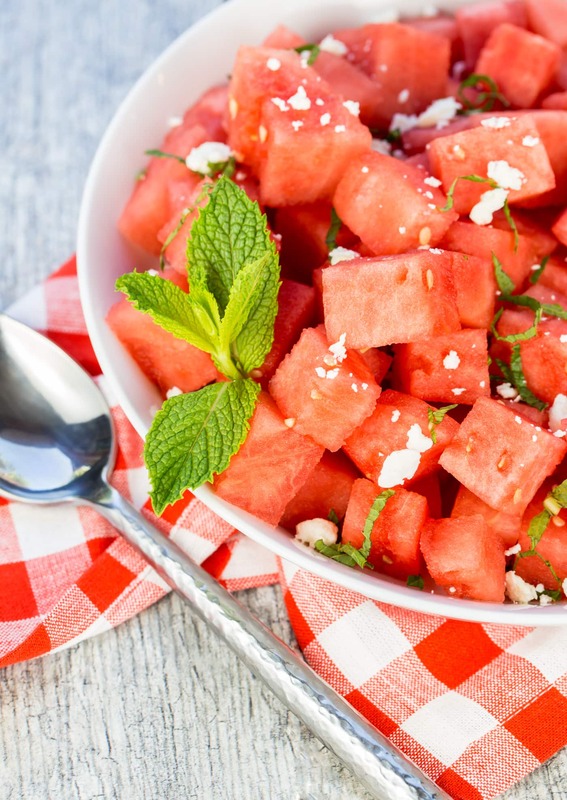 A great way to put a spin on regular watermelon! Don’t forget the whole grains when planning your Easy BBQ side dishes. 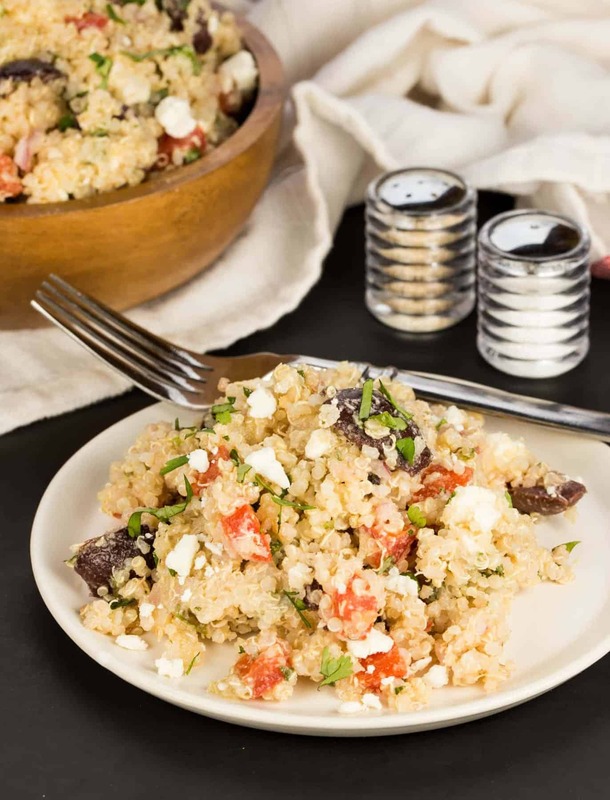 Make a double batch of this craveable Mediterranean Quinoa Salad and enjoy it for lunch all week long. Looking for more easy BBQ Side Dishes? (We can never have enough recipes!) Check out some of these tasty options! At Thanksgiving, my favorite part of the meal is the sides. 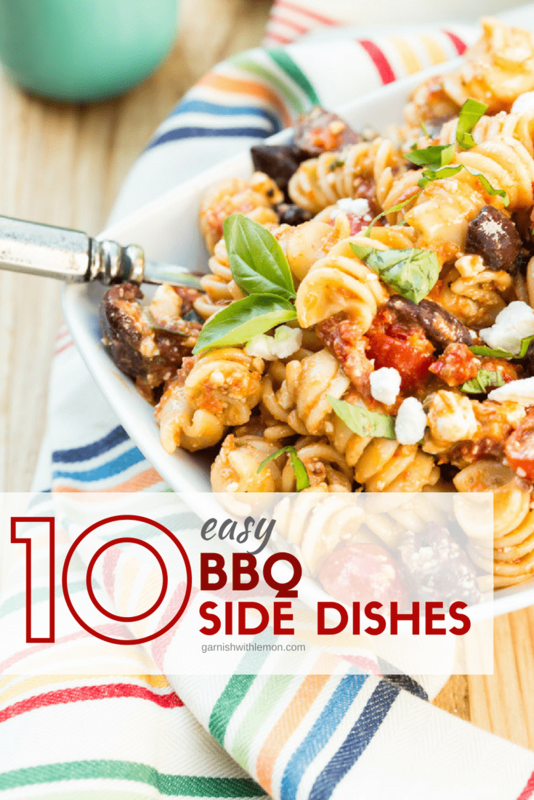 I love the idea of a variety of BBQ side dishes to have on hand for meals. Thanks for a terrific round up–I’ve pinned to Rockin’ Recipe Round Ups because this rocks.